Fashion fans at London’s BFC Fashion Film event will transform their smartphones into virtual reality headsets to experience content from fashion brand River Island via Google Cardboard. River Island is the first fashion brand to use the new Google Cardboard ‘simple, fun and inexpensive’ cardboard headsets to create virtual reality films. The brand is using the app to give users a 360 degree interactive film experience, building brand awareness and engagement for the new Design Forum x Jean-Pierre Braganza collection, launched this month. Users simply download the app to their iOS or Android device, then insert their phone into a cardboard headset. After viewing the virtual reality experience, the app will also allow users to share a 3D image of a Kingfisher Bird across social platforms and shop the collection. 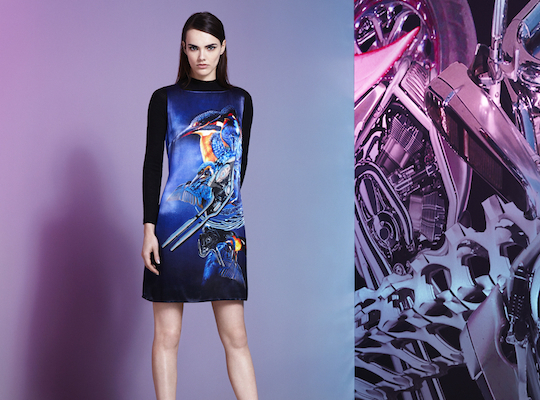 The Design Forum x Jean-Pierre Braganza collection is a partnership with the British Fashion Council which commissions young designers to create limited edition collections each season.